I spent the last few days in Madison, returning to the city where I lived for many years in the 90s. I hadn’t been back there in almost 10 years, and I wasn’t sure what to expect. The major event was the rally on Saturday, March 12. This started off with a tractor-cade around the Capitol Square at 10 am. Dozens of tractors came from around the state in protest of Governor Walker’s proposed cuts and attacks on democracy. The streets were lined all the way around the square with throngs of supporters cheering on the drivers. 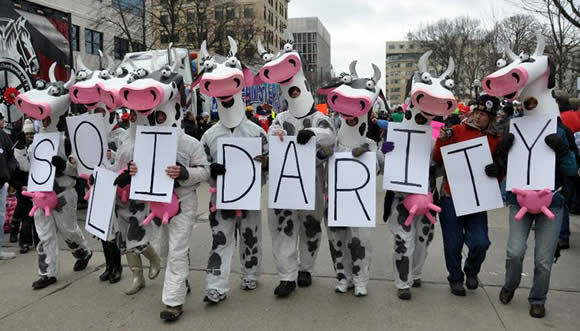 There was even a line of people dressed as cows, with letters on their stomachs spelling out SOLIDARITY. After the tractorcade, other groups began coming in. There was a feeder march of artists, a group of Students for a Democratic Society cheering for free education, a firefighters march, and even a long line of taxi cabs honking out “this is what democracy looks like.” All groups converged around the Capitol building for a 3 pm rally. The 14 Democratic senators returned to the state and came to the rally to loud cheers. There are wildly differing estimates about the size of the rally, depending on who you talk to. Some Madisonians said they were almost getting so used to big crowds that they could no longer tell if this one was large or not. But almost everyone I spoke to seemed transformed by the last few weeks, saying it was like nothing they have ever experienced. The rally was incredibly moving for many reasons. First, the passion that people brought with them was palpable. The signs were mostly homemade and incredibly creative. I can’t even begin to list all the beautiful and funny slogans I saw – not to mention intensive artwork and thoughtful expressions. The range of topics was broad – some emphasized labor rights, others focused on thanking the Democrats, others focused their anger on Walker. Many were long messages about war, inequality, democracy, and justice. There were supporters from many parts of the country. The second part that stood out was that in many other contexts, many of the people at the rally might be the kind of person you would expect to see at a Tea Party rally. The people in attendance were mostly white, and many of them older people. If you could judge by looks alone, you could say this was the white working and middle class. And by lots of polls from the last two years, as well as the November 2010 voting results, you might guess that this was a fairly conservative group. And yet people seemed thirsty for justice and fairness. I was with a group calling for “No Cuts/No Concessions Campaign” – we held signs that said “Blame Wall Street,” and “Tax Corporations,” and we had a wildly enthusiastic response. People came up and asked for our signs – many even traded in the one they were carrying for one of ours. And when we chanted, “How to fix the deficit? Tax, tax, tax the rich” – people joined in eagerly and happily. Wisconsin gives us hope that rightwing populism can really have a left counterpart. But perhaps the most moving part of my time there was not the rally itself, but all the times that were not the official rally. Because what is happening right now in Madison is that people are just constantly out, walking around the Capitol, protesting. They sometimes walk alone, some walk in groups, some come as a family, many are elderly people walking slowly around. Most people have their own signs and wear buttons and stickers, and some bang a drum or play an instrument, but some people just walk. Much of the past few days was pleasant weather for Wisconsin standards, but in the dark or when the wind picked up, it dropped to the 20s and below – and yet people kept walking. They didn’t seem to have a specific target or goal other than to express their anger and to not be silenced. And don’t forget – this isn’t just going in Madison. There continue to be protests in other parts of the state. High school students have done walkouts in Milwaukee, Eau Claire, Sheboygan. On Sunday thousands protested in Green Bay at an event where Walker spoke. Protests have occurred in the home towns of the Republican senators and at Republican events for the past several weeks. For part of Sunday I participated in the St. Patrick’s Day parade around the Capitol square. Most of the floats were what you would expect – Irish musicians, local businesses, and people throwing out candy. We were the last float, a truck sponsored by the National Nurses’ Union and driven by a firefighter. In the back of the truck were more firefighters, an Irish singer, and two men dressed as the Koch brothers holding a Scott Walker puppet. Around the truck were a ragtag group of marchers from the IWW, Wisconsin Network for Peace and Justice, some ISO members, immigrant rights activists, teachers, and the head of the Dane County Building Trades riding a scooter. A family showed up with a father carrying the sign, “60% Irish, 100% Union,” daughter: “30% Irish, 100% union,” and mother’s sign: “0% Irish, 100% union.” We carried the same “Blame Wall Street” signs and marched with No Cuts/No Concessions flyers. The parade route was lined with families dressed in green with children eager for candy. When we came up many people were eager for our signs, and we passed out dozens and dozens as people cheered us on. People in the crowd had their own homemade signs, denouncing Walker. What I saw in the parade and throughout the whole three days was a tremendous sense of community. It is not that there are not disagreements, because certainly people do not all agree on what to do next. Some are die-hard Democrats who think the main focus is the upcoming elections and the recall votes. Others hate the Democrats as much as they hate the Republicans, and think workers can’t trust either. There are also some degree of divisions around race and ethnicity, which is not surprising in general but particularly in a overwhelmingly white state. The crowds at the protests are overwhelmingly white, but not completely white. On Saturday night I attended a meeting hosted by the IWW, about planning for a general strike. A panelist from MEChA said she had been at the Capitol and felt out of place. Another speaker from a Friday night event said, “Don’t just call me when you want a person of color on your panels, but call me when you want to talk strategy.” A few people said that occupying the Capitol takes a certain amount of privilege to begin with because people of color and people without documentation have a different relationship to the police. But despite differences, it seems that people are discussing some of these issues and creating spaces in which to have further dialogue. It is hard to know for sure what is going on from the outside, and I think even many people in Madison feel it is not so easy to fully grasp the dynamics and dimensions of this quickly developing and changing movement. But the overwhelming feeling I had was that people are all sensing and hoping that we are on the brink of something different – a bigger, more inclusive fightback. An opening when middle class white people might see their interests more in line with those who have already been marginalized and exploited, rather than with those in power. There was as real feeling of solidarity, in a deep sense of the word. There also still seems a sense of awe. Who could have ever predicted such a tremendous outcry to Walker’s bill? Who could have predicted statements of solidarity from such a broad range of people in Wisconsin and around the world? And then of course, everyone was caught off guard when the Republicans split the bill and passed part of the legislation. It seems that people on the ground are still in a bit of shock from the past three weeks. They moved from protest to occupation to outrage, and now it is time to take stock and plan a longer-run strategy. A lot of attention is now shifting to the recall campaigns: primarily, eight Republican Senators that people think could be possible to get rid of based on the voting habits of their Districts. People also want to recall Walker, but this can’t happen until he is in office for a year. The recall effort makes sense for many reasons. Public sector workers can “change their boss” by voting. The recall is a way to express outrage for the maneuvers of the Senate body. It seems clear that Republicans will not compromise on anything, so all upcoming legislation will be blocked if some of these senators can not be replaced. However, focusing on an electoral strategy alone is likely death to the movement. First, it will take a long time and people will lose momentum. Second, it leaves out many activists who live in Madison or Milwaukee, or other cities with Democratic senators. Third, the best case scenario is that all eight Republicans get replaced with Democrats. But many Democrats have supported the same kinds of austerity programs that Republicans are pushing. Other Democrats have gone along with attacking union rights (and Democratic governors reside over some states that do not even allow collective bargaining rights at all). What good is a recall without changing the politics? To do that, activists need to maintain their ability to mobilize and organize and hold politicians accountable. In addition, activists need to develop their own program or agenda to reform the state. There are a lot of good ideas for fixing the deficit, and politicians running for office should be required to endorse the reforms necessary to restructure the tax system as well as spending priorities. There are many better ways to plan a state budget, and this movement should perhaps develop some ideas of their own about what they want to see. Jim Cavanaugh, president of the South Central Federation of Labor noted that this might be time for people to think hard about what they want from government. Is it just plowing streets and building roads? Or is it that and more? Ideally, protestors can coalesce around a platform of demands and use that to make decisions about endorsements. If the recall petitions are successful, there will be new candidates stepping up, and they should commit to the platform. Otherwise, they should not get the support of the coalition. We do not need to keep throwing money and time after candidates that do not support working class reforms. A second wing of the strategy is a corporate type campaign against some of Walker’s major donors, such as M&I Bank and Kwik Trip convenience stores. This will involve actions like the one last Thursday in which firefighters, teachers and police withdrew almost $200,000 from M&I Bank in a day. This might also be a useful strategy, but this also doesn’t seem enough. The strategy relies on researchers and lawyers, and is likely to be driven from the top-down. Will this strategy let the rank-and-file union members and grassroots community groups feel empowered? Will many voices get to participate in strategy? A third element is the legal strategy. Lawyers are already challenging the way in which the Republicans split and passed the Budget Repair Bill. Legal strategies are important, but even more demobilizing for activists. On the other end of the spectrum of activity is the idea of a general strike. Many people watching Wisconsin are aware that the South Central Federation of Labor (SCFL) passed a resolution in favor of educating around a general strike, and the head of the Madison firefighters was on record in widely circulated video saying he supported the idea. But despite wide enthusiasm for the general strike idea in many sectors in Madison and around the country, others have raised concerns. Could we pull it off? Who would do it? If public sector workers strike will it anger and alienate the public (such as parents)? Will it actually move the governor, or will it play right into his hands to privatize public sector work? And for unions that have not been effective communicating and strategizing with their rank-and-file members for a long time, how do they even begin to build for something this large? What people need is more options that are between the recall effort alone, and a general strike. These can be like the “Ontario Days of Action,” that are smaller activities, but targeted, and could build. They could include direct action on the corporate donors in ways that allow the creativity of the time to flourish. It might involve targeting particular sectors or key locations. Most importantly, the actions need to tie together labor issues with social services, attacks on bargaining with cuts in programs. The movement can not let itself be broken, and partners can not take deals for themselves and jump ship. This will require that unions and community groups together rebuild their own organizations and social movements. The kind of fights that the Wisconsin working class faces are happening in every state. This includes attacks on unions, immigrants, poor people, people of color, women, and students. Stopping the right-wing attack will take a lot more than just a fight in Wisconsin. We need to rebuild the best of the labor movement, the best of the civil rights movement, the best of the student movement, the best of the women’s movement, and so on. I’m not sure what to think about the next steps, and the next few months in Wisconsin. Over three days I went from incredible optimism to deep despair and back again. There seems to be a real leadership vacuum and lack of strategy. There isn’t a good system of communication between rank-and-file members and their leaders, between organizations, and between different parts of the state. There is a lot of fear out there, and much of that for good reason. Fear of losing your job. Fear of losing even more of your paycheck. Fear of losing public support. Fear of betrayal by the union leadership or the Democrats. Fear that sectarian leftists, or that rightwing or government plants will destroy real organizing efforts. And yet the depth of passion is undeniable. It is intense and it will not go away. People have seen a vision for fightback and a vision of an alternative. I think our old models of organizing have much to offer but we need to learn from new models as well. This includes creative ways of holding large-scale and democratic meetings – perhaps how is done in Latin American. It includes new thinking about moving employers when you are in the public sector. We have to learn how to allow for local creativity yet build a national, and perhaps international movement of those fighting similar, and sometimes the same, adversaries. We need to find ways to better integrate the public and private sector workforces so that they see their own fights as intertwined. We have to understand that care workers and the people they serve have many shared interests, and we have to build our movements in that way. A teacher’s working conditions are a student’s learning conditions, and vice versa. Patients’ lives are at stake when nurses are overworked or understaffed. Teachers cannot teach and nurses cannot heal when the people they serve are living in poverty and do not have adequate food or housing. The coming week will be a time for activists to switch gears – from the occupation and outrage, to transitioning to a longer haul fight. Strategy meetings are beginning to draw out common objectives. Many people know they need to keep up the momentum and cannot rely on the recall alone. There is a healthy dose of skepticism towards official leaders and outsiders. In the coming week, activists will need to tighten their research on targets, develop structures for communication and setting goals, continue with direct action, and organize. In the short-term, there are a number of planning meetings set up for the week, including larger formal ones called by the We are Wisconsin, labor-backed coalition, as well as smaller ones of various organizations trying to move forward. Rallies and marches are still planned all over the state. In two weeks, Labor Notes will host a Troublemaker’s School in Madison. People are planning for the April 4th national day of action. April 5th is an election for a State Supreme Court position. The calls for “recall” will be loud, and national forces are already putting lots of resources and effort into these campaigns, including television ads and robo-calls. But the beauty of the Wisconsin fightback highlights the ways in which relying on old methods was not enough. No doubt Democrats and labor unions bought lots of ads for the November election and still lost big. This time around, union leaders need to talk with (not “at”) their members. Workers need to keep talking with co-workers; neighbors with neighbors. Luckily, some of those structures are in place from many years of organizing in Wisconsin and the hard work of unrelenting activists. That, combined with new energy from hundreds of thousands of people, can really show us what democracy could look like.